I received the 8" Ozeri Green Earth Smooth Ceramic Nonstick Frying Pan right before Christmas for review and really put it to the test. After reading so many negative comments about this pan loses it non-stick ability a month or two, I had to see if for myself -- hence the delay in my blog post review. We are now a month and a half in and this non-stick pan is still working great -- just like it was the first day of use. I have cooked everything from bacon, fried chicken, eggs, pancakes and even seared fish and cooked a medium rare filet mignon in this stylish pan. While I wish the handle was a little bit more durable (it is plastic), it doesn't get hot during cooking, which I love. And, I have been seasoning the pan with vinegar as the vendor suggested, which keeps its non-stick ability going strong about 1 1/2 months. 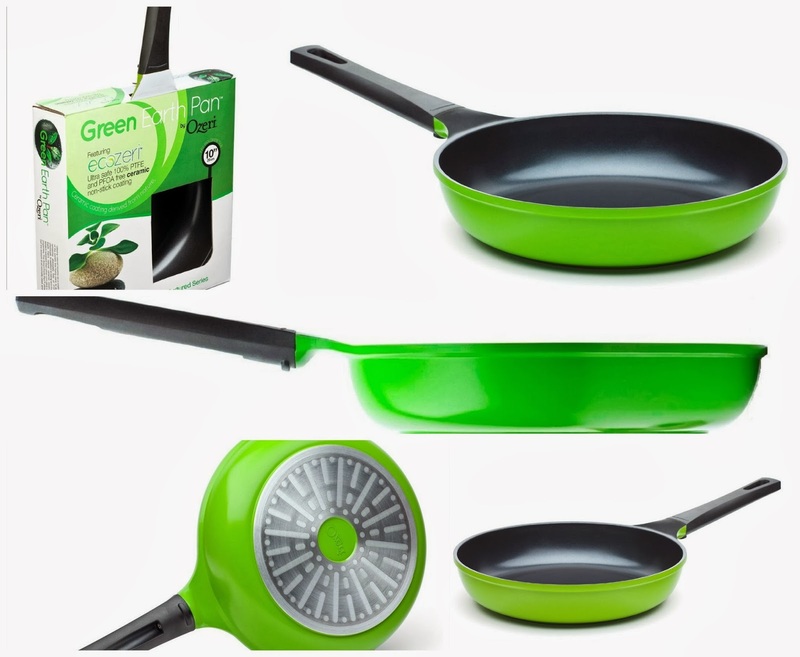 "Utilizing GREBLON -- an ultra-safe ceramic coating from Germany, the Green Earth Pan by Ozeri is one of the world's first frying pans to achieve non-stick perfection while remaining absolutely free of PTFE, PFOA and other harmful chemicals. Conventional cookware and other ceramic cookware brands achieve their non-stick performance through a coating of PTFE (PolyTetraFluoroEthylene), a synthetic substance that has waxy properties. At very high temperatures, PTFE begins to decompose and release fumes which are documented to be lethal to birds and small pets, and which can be harmful to humans. In addition, traditional pans incorporating PTFE are often manufactured with the aid of PFOA (PerFluoroOctanoic Acid), which the EPA has classified as a 'persistent pollutant of the environment'. With the Green Earth Pan's GREBLON ceramic from Germany, even under high temperatures, no harmful toxic fumes are ever released into the environment. This is because the Green Earth Pan utilizes a 100% ceramic coating inspired by nature - not a laboratory. The Green Earth Pan's ceramic coating is completely free of PTFE and PFOA, and far more durable and scratch-resistant than other non-stick surfaces. With better non-stick properties, the Green Earth Pan allows you to saute, fry, bake, boil and braise with as little as half the amount of oil normally used, and cleaning is a breeze. The Green Earth Pan by Ozeri is made of the highest quality die-cast aluminum that allows for even cooking and fantastic browning without hot spots. It boasts a magnetized bottom for rapid heat transfer on induction stoves, and a heat resistant silicone coated handle. This version of the Green Earth Pan features a textured ceramic cooking surface. The elevations of the textured cooking surface create air pockets which distribute heat underneath food to enhance cooking performance. Your satisfaction is guaranteed. GREBLON ceramic made by Weilburger GmbH, Germany. Final assembly in China." Even though this pan clashes with the other pots and pans in the pan rack above the kitchen island, it does draw attention when friends and family come to visit. They ask about the pan, and I can't help but rave about it, and let them see this non-stick cookware up close. Some have said it was a little heavy for an 8" pan, but I have been using daily that I don't notice this. Unlike other high end non-stick cookware that I have bought at top kitchen stores and retailers, this one from Ozeri cooks up foods well. It balances out the heat throughout the pan, so if I am cooking a few items in the pan, they all cook up the same. I can't tell you how many times other pans didn't heat evenly and I had food sticking and burning as i was cooking in the other pans -- thus having to through out the whole contents in the pan. I can't wait to pick up additional Ozeri cookware, now that I have been able to try firsthand this non-stick pan and love how it has held up, and is still working. Maybe others who left comments didn't season or wash the pan the right way, thus resulting it it to lose its non-stick feature. But, when it comes to washing this pan, when nothing sticks, you simply have to wipe dry with a wet washcloth or a little sudsy water and wipe dry. No need to rub it with a scubby pad (which will remove the non-stick layer). If you are looking to update your pots and pans, or just need a good non-stick pan, why not check out this 8" pan from Ozeri, which retails at Amazon for only $25.95. I would really love to have a couple of these pans. I also love that they are so afordable thanks for sharing as I had never heard of these until I read your post.